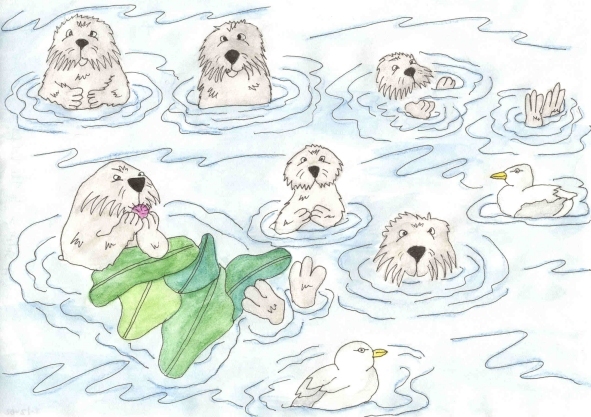 A raft of sea otters floated among the kelp fronds. Waves lapped against their fur as they bobbed up and down. "I’m tired of eating mussels," whined Chloe. "Do you know how long it’s been since I’ve eaten a sea urchin?" "Och, that sounds delicious," Ainslee agreed. "I can almost taste it now. Yummy." "Why don’t we each go down to the bottom and see if we can find a few? Wee Bonnie, you’ll have to stay up here though. Mummy will bring you back a crab or an abalone. Would you like that?" Maisie asked her bairn. "Yes, Mummy. I’d love a crab," wee Bonnie said. "You stay here and we’ll be right back. Hold onto the kelp fronds," Maisie said. The other sea otters in the raft dove beneath the waves. They went from rock to rock, looking everywhere. When they surfaced, they had an assortment of things. "I found three mussels," Leslie said. She lay on her back and pounded the blackish-purple shells open with a stone she’d carried up. "I found two abalone," Mahri said. She started banging them together, anxious to have the tasty meat inside. "Mummy brought you a crab," Maisie said, handing wee Bonnie the wriggling crustacean. Wee Bonnie lay on her back and bit into the crab’s shell. "Delicious," she said, gobbling down the tender meat inside. Maisie had picked up a few crabs for herself and started eating them. Chloe had an octopus in her paws. "Och, I hope it’s not too tough. Sometimes octopus is very chewy," she said. She bit into it. "Brilliant! It’s tender and delicious." "You’re being very quiet over there, Ainslee," Mahri said. "Didn’t you find something to eat?" Ainslee was hiding among the kelp. "Ainslee, what have you go there?" Chloe asked. Wee Bonnie swam over to see. "She’s got a sea urchin, Mummy. It’s purple and crunchy." "What? You found a sea urchin?" Maisie shouted. "You were going to hide it from us, were you?" Ainslee lay on her back nibbling away on the urchin. "Well! You could have offered to share," Mahri said. "Aye, Ainslee," Leslie added. "You could have given each of us a wee bite, especially wee Bonnie. She’s never tasted urchin before." Ainslee stopped eating. "Och, all right. Come here, wee Bonnie. I’ll give you a bite, but the rest of you will have to find your own sea urchin." She bit a piece off and gave it to the wee one. "That’s delicious. I like sea urchin. I want more sea urchin, Mummy!" wee Bonnie began to wail. "Now look what you’ve done!" Maisie said to Ainslee. "You’ve gone and made wee Bonnie cry." Suddenly Ainslee disappeared beneath the water. "Where did she go?" Leslie asked. Ainslee surfaced a few minutes later. "Here you go, ladies. Urchins for everyone," she giggled and passed one of the prickly purple creatures to each of them. I found a whole lot of them. Here’s one for you, wee Bonnie." The sea otters tossed their crabs, mussels, and abalone into the waves and nibbled on sea urchin. Two seagulls came flying by and spotted the half-eaten shellfish. They landed near the raft of sea otters. "We’re eating sea urchin," wee Bonnie told the seagulls. "It’s delicious." The seagulls squawked and flew off with their leftover bits of abalone, mussel and crab. "You told them!" Maisie laughed. The others joined in. "You can’t have sea urchin every day, wee Bonnie, but now and then for a special treat, we’ll find you some," her mum said. After they’d finished eating, the otters lay on their backs and took a nap as the waves carried them gently out to sea.